It’s nice to be able to look back on a growing season and evaluate positives and challenges that may help us make decisions in the future. To my eye, I saw a high quality vintage year for 2015. Although we had a relatively wet spring, most growers properly managed their vineyards and kept their vines heathy through the challenge. July, August and most of September were quite dry giving the grapes a chance to mature well and develop balance and ripe flavors. We had a big storm in late September but much of that 6″ rain ran off into the streams rather than saturating the ground and harming the crop. The hurricane scare of Joaquin stayed well off shore giving us some clouds, wind and a little drizzle. As far as yields go, many growers found their vines little fuller with fruit than predicted. Some of the newer plantings carried crop this year giving the growers some well needed return on their investment. As there is some unexpected fruit brought in, there are a few areas that this fruit can go. There is a spot market at harvest time where growers and winemakers will communicate by phone, email or Facebook about needs for fruit or availability. For us here at Fabbioli Cellars, the yields off of our estate vineyard were down because of the very cold winter, but our satellite vineyards produced quite well. Many wineries are built to hold extra capacity. The grapes can be made into wine to extend a vintage of wine allowing the next vintage to age longer. It also can be made and later sold to another winery as bulk wine. The purchasing winery may have just opened and is in need of wine to sell or the wine could be part of a private label for a restaurant or wedding. Also, our local distillery can help out the wineries in years of crop abundance. Turning a wine into brandy can reduce the size of a batch of wine over 10 times turning a 10 barrel batch into a 1 barrel batch of brandy. I am also seeing winemakers buying regional fruit rather than just their own state. For us, all of the state of Maryland is closer than many regions of Virginia so we ended up buying Vidal Blanc from 40 minutes away on the other side of the Potomac. 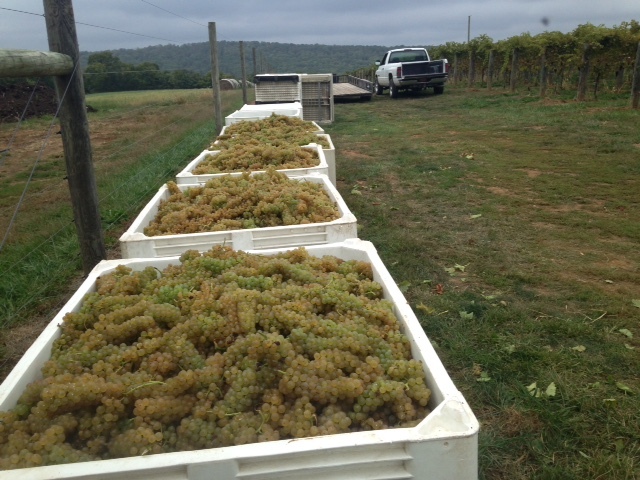 There will always be some fluctuation in the supply and demand for wine grapes in Virginia. More plantings are on the horizon as many more wineries are opening their doors. The visibility of our product continues to grow, the quality recognition is there and our pricing is becoming more in line with other crafted wines from around the world. Bring home a bottle of local goodness today.